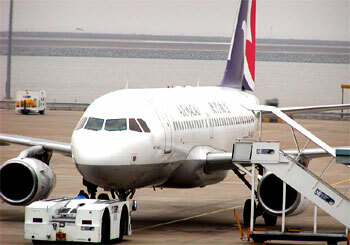 Air Macau is Macau's national airline carrier and its main hub is located at Macau International Airport. Founded in 1994, the airline company has a fleet size of 19 aircraft including aircraft model types of Airbus A319, A320 and A321. 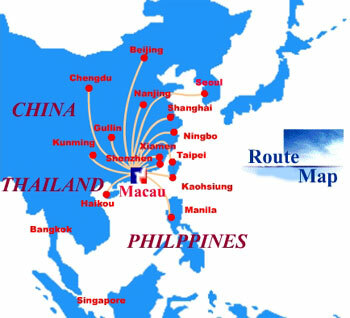 It operates scheduled flights to over 19 cities mainly in mainland China and some regional flight destinations. Air Macau Cargo handles freight services to several places in China and Taiwan. The fleet used for cargo handlings include Airbus A300B4-100F, 200F, 600F, Airbus A319, Airbus A320-100/200 and Airbus A321-100/200. Perhaps more than 70% of Air Macau's total revenue are coming from transportation between Macau and Taiwan, across the Taiwan Strait. There are around 72 round trip scheduled passenger flight services between Macau and Taipei and 28 round trip flights operating between Macau and another Taiwanese city of Kaohsiung.